Learn about the Town of Sedgewick’s facilities for recreation, entertainment, education, and more. This facility hosts many community activities, such as curling, skating, hockey, bowling, baseball, football, lacrosse, the Ag Society, rodeos, rock concerts, festivals and much more. The Wild Rose Co-op Recreation Centre is also the home of the Sedgewick Public Library and the Sedgewick Playschool. For inquiries or event bookings please contact the Recreation Centre at: 780-384-3751 or via email at: sedgewickrec@gmail.com. Find out about upcoming events on our Facebook page. View a map of the Wild Rose Co-op Rec Centre. The Wild Rose Co-op Association supports community initiatives. The initiative currently available to the Town is for the individual purchase of gift cards in various increments: $25, $50, $100, $250, $500. Every dollar of each Co-op gift card spent results in a 6% dividend to the Wild Rose Coop Recreation Centre, and you, as Wild Rose Cooperative member, will also receive your full dividend. Co-op gift cards can be purchased at the Town Office. The Library is located in the Sedgewick Wild Rose Coop Recreation Centre at 5301 – 51 Avenue, upstairs at the south end of the Centre. You can access the library either from the outside stairs or via the elevator located in the concourse of the Rec Centre (use the door under the outside stairs, at the south end, to enter). Drop off Boxes for books are available at the Sedgewick Co-op Lobby and the Wild Rose Coop Rec Centre Concourse. Library on Wheels: The Sedgewick Public Library provides library services to anyone housebound. Call the librarians to request a particular title, genre, or author you would like delivered to your home. With the inter-library loan you can borrow books and audiovisual materials (CDs, DVDs, audio-books, etc.) from other libraries in central Alberta through the Parkland Regional Library System and across the province through the Alberta Library (TAL). You can also borrow books from outside Alberta. The Library will contact you when your item has arrived, or you can have it delivered directly to you. For assistance in making an inter-library loan please speak to one of our staff. Audio-books/e-Audio-books: We have a collection of audio books available as CD’s and tapes. Download a large selection of Audio-books to your Mp3 player or iPod through NetLibrary. Databases: We have access to a wide variety of databases on topics such as health, books, and technology through the Parkland Regional Library. The Nights Alive Youth Centre is available for youths from 14-17 years for fun and recreation at 4809-49 Avenue in Killam. It is located in the FFCS Building, and can be accessed via the back entrance to the basement. Call 780-384-2256 for bookings of the regular sites. The Lake Board has implemented a Senior’s discount (60+). Stay Sunday to Thursday and pay only $25.00/night for a full service lot (except on long weekends). 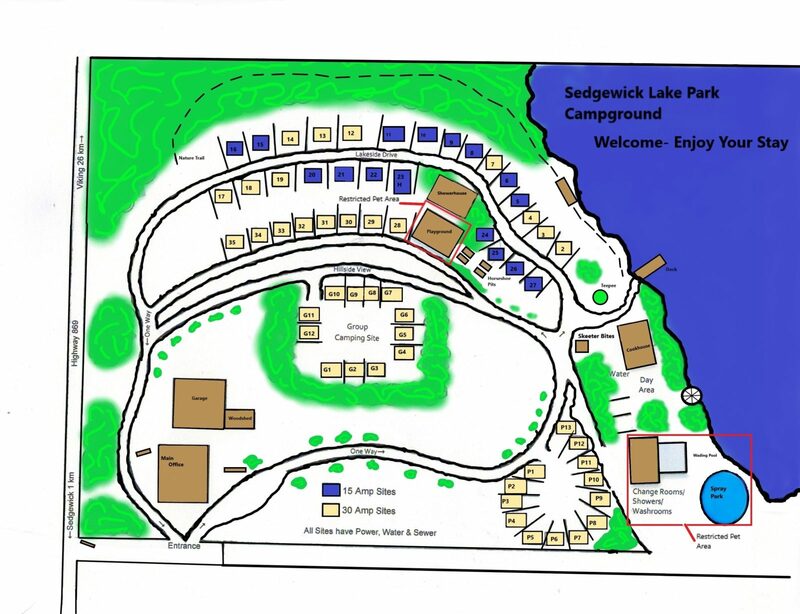 Sedgewick Lake Park Board will accept written requests from parties that wish to reserve the group camping site in advance for special occasions only. Special occasions are defined as events like weddings, reunions, etc. The Board will review requests at the next scheduled Sedgewick Lake Park Board meeting and reply in writing to the parties stating if the reservation is approved. Parties MUST provide a 20% deposit for the Group Site once notice has been given. The 20% deposit will be credited on the final bill. There shall be a two-week cancellation period. Full deposit will be kept if the reservation is cancelled within the two-week period. 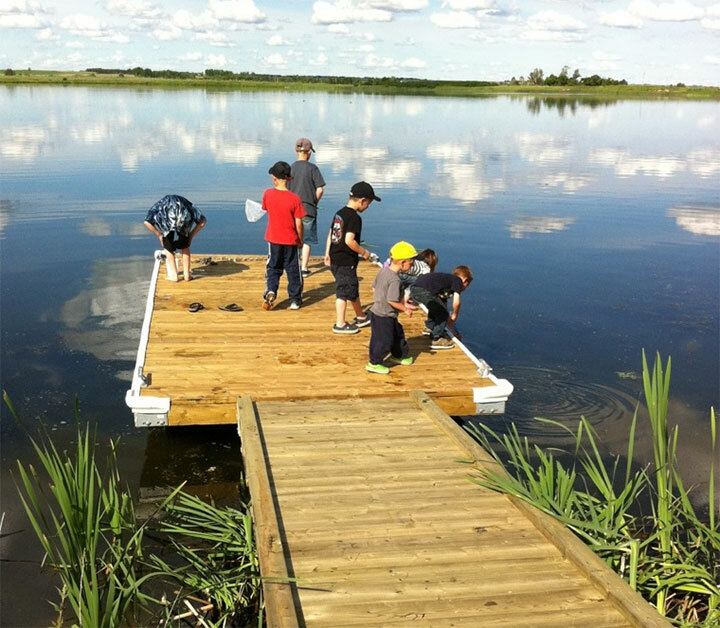 The Sedgewick Lake Wading Pool is maintained at a constant 78 degrees during the summer camping season. Summer Family passes can be purchased at the Sedgewick Lake Campground Office for $40.00. Daily drop-in fee is $2.00/child or $5.00/family to be paid at the Lake. The pool can be accessed for free with camping fees. Please note that children under the age of 12 MUST be accompanied by an adult while at the pool. Any children not supervised will be asked to leave the pool. This is a policy of the Sedgewick Lake Park Association.